Here's a transcription of a John D MacDonald profile from 1978. 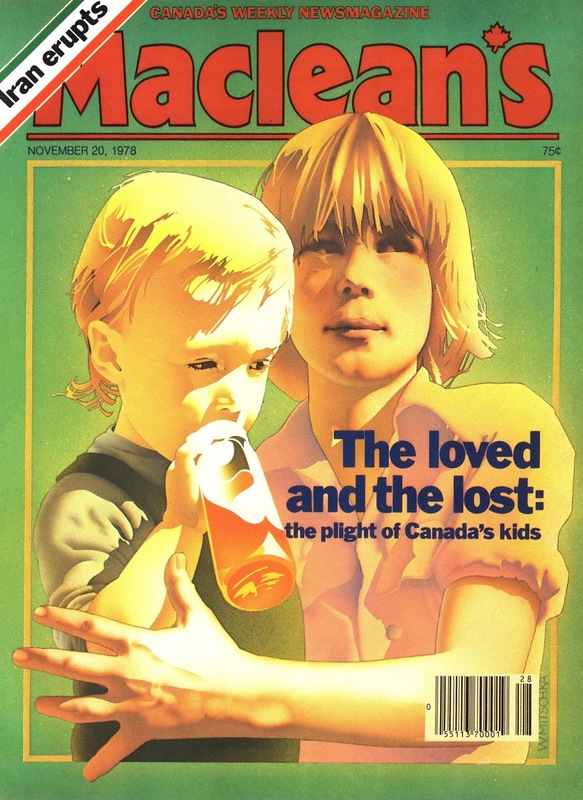 It appeared in the November 20 issue of the long-running Canadian news magazine Maclean's, written by one Charles Oberdorf and titled "The Dauntingly Prolific Beige Typewriter Keys". There's little new here outside of the photo, which I'd never seen, but MacDonald does drop a hint as to the source of some of his plots -- Harvard Business School case studies -- and the piece ends on a rather sour note. Still, it's always nice to read one of these articles. 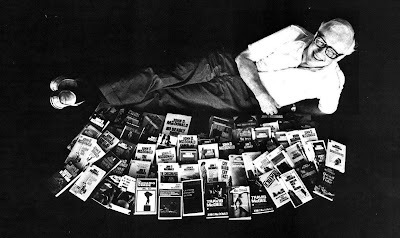 In 1957 an award-winning novelist and playwright, talking casually with writer John D. MacDonald, airily dismissed MacDonald's paperback thrillers as drugstore fiction. MacDonald, miffed, made a bet that within two months he could produce a book that would be published in hard as well as soft covers, serialized in a slick-paper magazine, become a major book-club selection and then filmed. The novel, The Executioners, quickly fulfilled the first three conditions and the film, retitled Cape Fear, starred Gregory Peck and Robert Mitchum. That bet, which MacDonald now describes as "childish," shifted his career into an incredible and sustained high gear. The prolific proof: 63 titles selling an estimated 68 million copies. Condominium was on The New York Times hard-cover list last year for six months; Fawcett printed 1,650,000 paperback copies. Two days after the U.S. publication of his newest thriller, The Empty Copper Sea (McClelland & Stewart, $11.50), the publisher ordered a third printing, taking the hard-cover run to 95,000. Copper Sea is the 17th in MacDonald's Travis McGee series. Though MacDonald dodges questions about McGee's origins, according to publishing legend the detective was conceived to embody all the fleshy fantasies of middle-aged, middle-class North American men. Surrounded by beach bunnies on a luxurious houseboat, McGee "takes his retirement in stages,” working only when he needs cash. It's the life -- teak decks, twin Hercules diesels, thick steaks and tall women. Always tall women. Initially, MacDonald says, McGee was "too morose and Germanic,” traits that have resurfaced in recent books. The ex-Marine, ex-professional linebacker has always sounded off against the little nasties in the world around him-everything from the decline of Plymouth gin to the despoiling of the Florida coastline. But his creator admits that lately there's been "a kind of malaise." McGee is getting older and his friends keep getting killed. "Your friends serve as your identity. McGee's gotten involved with people, but I keep popping them out of his life. You say those people can be replaced, but they can't. You can't keep going around explaining who you are. So you begin to lose identity. His life keeps getting narrower, and this is like darkness." Determined to do something about McGee's isolation, MacDonald allows that malaise to deepen in Copper Sea. The Harvard “B” school's alumnus is a man of florid face, square jaw and snowy hair who takes life at a pace selected for maximum comfort. Looking 10 years younger than his 62, there's still a frailty that comes from a life of minor illnesses that began with dengue caught in Ceylon in World War II. He's large of frame (as McGee readers might expect) but with the underdeveloped arms and legs of a man who has spent most of his working life behind a desk. There are two desks in his study in the large un-air-conditioned house in Sarasota where he lives with Dorothy, his wife of 41 years. One desk for each of the two books he is usually writing simultaneously -- one McGee, one not. No secretary. No typist. He produces all his own manuscripts and correspondence on a space-age IBM Correcting Selectric, which Esquire magazine once dubbed The Awesome Beige Typewriter. Human houseguests have become a problem for MacDonald since the McGee books began appearing in hardcover five years ago. He's become a subject of academic interest. 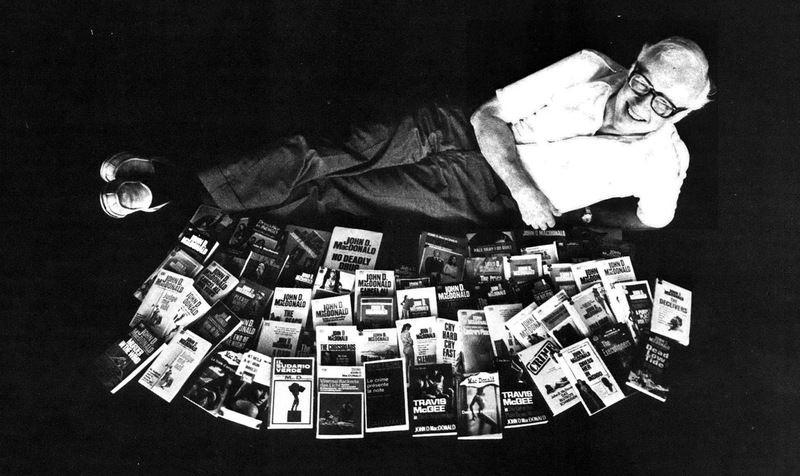 A John D. MacDonald Conference on Mystery and Detective Fiction, a paper on Travis McGee as “Traditional Hero," and so on. He's suspicious of lofty goals in life and art. “Curing yellow fever was a good thing, I guess, but that yellow fever cure is what has the world awash in people. There's really no way for anyone to prove that there's anything that's valid, that's worth doing." Travis McGee, at his most wryly cynical, couldn't have said it better. Welcome back, and as always good info. Welcome back. I never new McGee was a Marine? Always thought he was an Army Ranger ? Wasn't he a tight end? In GRAY he was an "offensive left end," and in TURQUOISE a "tight end." According to Walter Shine he was also a linebacker and a "corner man," but I can't find that anywhere.